" We are all visitors to this time, this place. We are just passing through. As such, let us act with wisdom and kindness." " We are all visitors to this time, this place. We are just passing through. As such, let us act with wisdom and kindness. " Founded in 1905, Domaine des Tilleuls is a family owned and operated winery dating back five generations. Today, Daniel, Evelyne, and their children Jérôme and Noémie, perpetuate this history and tradition through their shared passion for wine-growing. 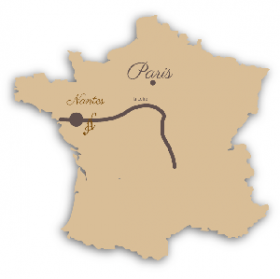 Located on the western side of the Loire Valley, near the Atlantic Ocean, our vineyard is spread over gentle rolling hills overlooking our village, on an exceptional terroir of schist based soils, ideally suitable for growing vines. 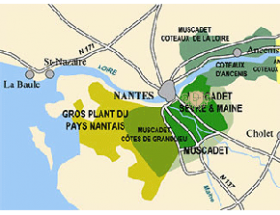 Our grapes are grown in the Pays Nantais vineyards, where cool maritime influences and a long growing season provides a unique environment for our different grape varieties. Management of the vineyard is done in accordance with the best practices of sustainable agriculture enabling the soil to express its very best qualities while contributing to the preservation of our environmental heritage for futures generations. Thanks to an authentic and shared savoir-faire, we are dedicated to producing high quality wines that define and respect our terroir. Our ambition is to create elegantly-textured Muscadet wines along with premium Loire white wines; each cuvée expressing the full potential of its grape variety and the typicality specific to each vintage. Our winemaking philosophy is based on a common resolve to continually improve the quality of our wines by emphazing on balance, finesse and complexity through the combination of both tradition and modernity. Ours is a family legacy, with simple and universal values such as sharing, the love of work well done, and authenticity. Our wines are today appreciated and enjoyed by wine lovers throughout France and in several countries around the world.
. LOIRE VALLEY WINE SHOW: February 04th & 05th, 2019 in Angers, France.
. WINE PARIS 2019: February 11th to 13th, 2019 in Paris, France.
. PROWEIN 2019: March 17th to 19th, 2019 in Düsseldorf, Germany.